Happy New Year! This is my first finish of 2017: "It Takes a Village" (gave up telling my son how to hold the quilt!). It measures 40" x 52" and the blocks finished at 6". 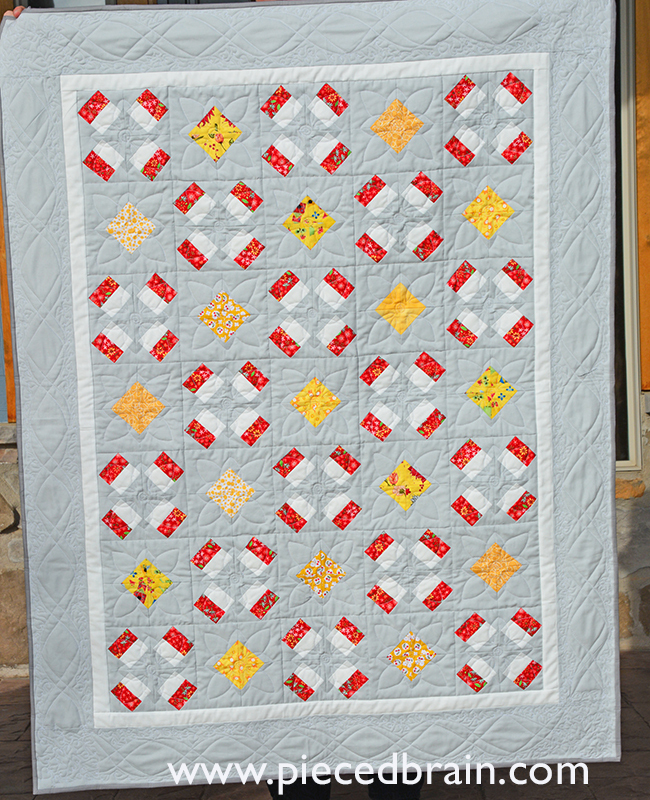 I used leftovers from my Box Garden quilt (red and white strips), Moda Bella Solids in light gray and white, and scraps in yellow. It was pieced with Aurifil 50 wt thread. 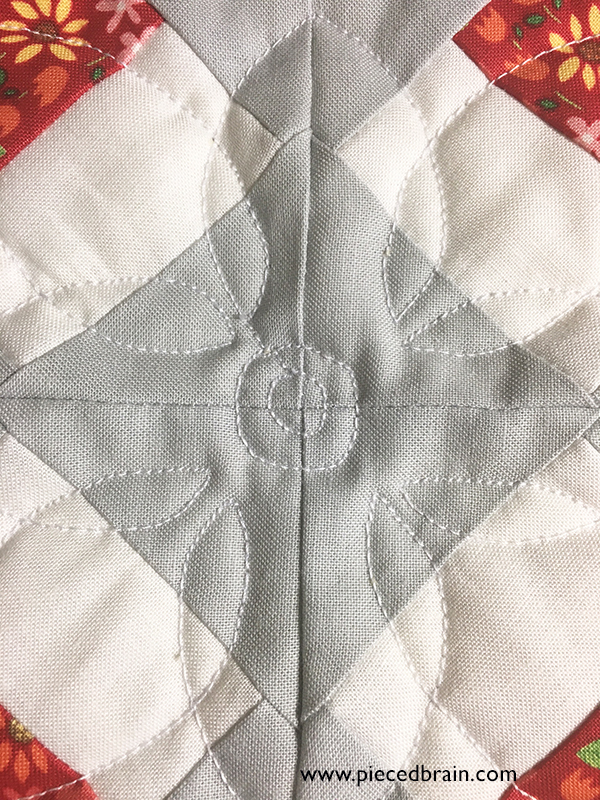 I freemotion quilted the flowers on the blocks (tutorial here) by tracing the motif onto paper, and used a template for the borders which I surrounded with leaves. You can see the red fabric better here, as well as the FMQ. 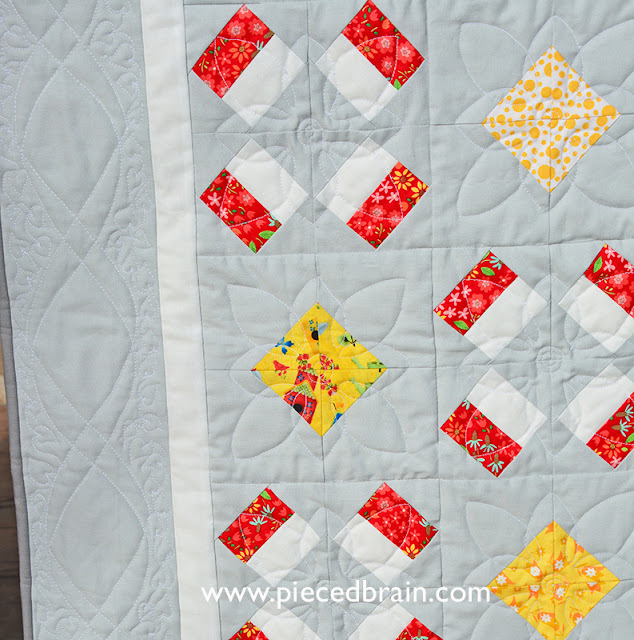 The quilt design is very simple, yet I really like this wall hanging! Gotta find a spot for it, though I am thinking it might make a great wedding gift as I have one coming up this Summer. My plan for 2017 is to work on my UFOs right along the new projects I will certainly begin. I have finished two this week, and am almost done with a new project... Yep, burning the midnight oil already! That's a great quilt and you did such a nice job on the FMQ. Thank you! I am thinking this pattern would look great in 30s fabrics and white!